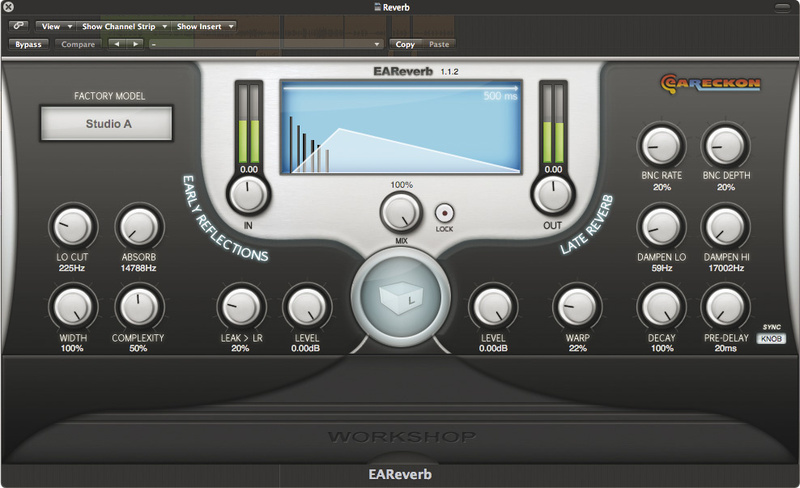 EAReverb is an algorithmic reverb plug‑in that follows the familiar algorithmic approach of having separate sections for creating the early reflections and the late reverb tail. Each can be adjusted using a handful of controls, and is represented on a graphical display at the centre of the window. The Size selector accesses seven room size options designated XXS, XS, S, M, L, XL and XXL — familiar to anyone who has ever bought a T‑shirt! Each brings up an appropriate early reflection pattern for that room size. A Width parameter further adjusts the apparent size of the synthesized environment by adjusting the spacing between the early reflections. Complexity adjusts the density of the early reflection pattern, while the 'Leak >LR' control feeds some of the early reflections into the late reverb decay generator to make them sound more diffuse and natural. This still works when the late decay level is set to zero, so you can set up only diffused early reflections if you need to. For the reverb tail itself, there are high and low damping controls, plus pre‑delay and decay time parameters, and a Tempo Sync option that forces the pre‑delay time to match the song tempo. Warp adds modulation to increase the complexity of the sound, while BNC, short for Bounce, adds further random elements to the late decay that can be useful in creating special effects. A number of factory presets are included to suit various styles, and any adjustments to these can be saved as new user patches. Clicking on the Workshop panel at the bottom of the screen brings up a spectrum analyser that shows both the early and late reflection spectra in red and blue, plus individual controls that set the delay, reflection level and width of the first six reflections, the latter apparently emulating the distance from the walls. In use, I soon discovered that as EAReverb is a true‑stereo processor, it wouldn't open in one of Logic's mono tracks or buses. I guess this is fair enough, though a mono‑in, stereo‑out mode might have been a nice addition. The early reflections patterns cover a lot of ground, from tiny spaces to huge halls, while the same reverb tail engine is used in all cases, just with different settings, which makes adjustment pretty easy. 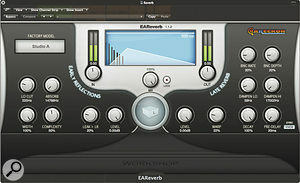 The manufacturers describe EAReverb as an "earthy‑sounding” reverb, and that's probably a good description, as it has a nice organic quality that approximates the characters of real spaces; on the other hand, it doesn't seem to be able to generate that larger‑than‑life glitter or splashy plate emulation that you get from, say, an old Lexicon unit. There's also no way I could see to change the shape of the reverb tail to mimic the way that, in some natural spaces, the decay shape develops in two or more stages with different slopes to each. 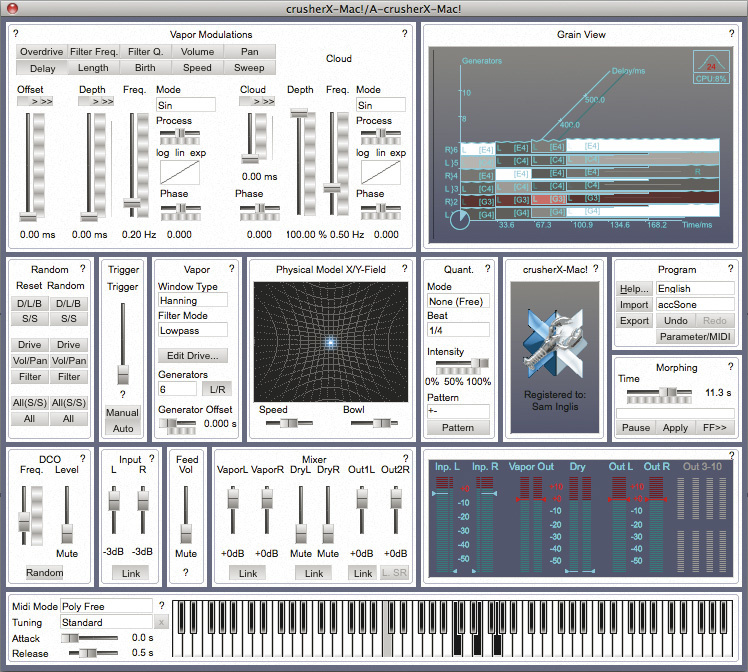 From AccSone and their icy blue lobster logo comes a granular‑based, MIDI‑assignable effects processor entitled CrusherX, available in three different versions: Mac!, Live! and Studio! These are, respectively, a VST/AU‑based Mac version, a stand‑alone version for live use and a PC‑based VST version, all featuring enough exclamation marks to make a town crier blush. Installing is a simple enough challenge/response process, carried out via a link to the AccSone web site, which is very chatty and informal (and sometimes in German), which promises that if you have any problems, "We will assist you fast and unbureaucratic!” If only my local council was like that. Upon opening up CrusherX, you're confronted with a white square panel containing lots of smaller, largely white panels, each containing a variety of graphical controls to get involved with. There are also three windows showing the 'grain view', an I/O display and an X/Y field within which you can load your own background pictures and lob a parameter‑assigned ball about. However, I do feel the whole thing could have been bolder with the on‑screen real estate. Everything feels cramped and intimidating, and it doesn't give a great deal away until you've done a bit of homework using the help menus, which I always find a bit of a turn‑off. Each panel has a little question mark situated at the top right‑hand side, taking you to a specific help page displayed in your Web browser of choice: a nice touch, but I don't see why the GUI couldn't simply have been a little bigger and more colourful. Currently, it feels a bit like walking into a small hospital. The manual, meanwhile, is given to explanations like "If the birth time is less the length of the grain the grains overlap, the grain‑system prevents for decreasing the birth time under 10 percent of the actual grain length,” which don't really leave you any the wiser, and some of the terminology is more Brian Cox than Brian Cant. This made it hard for me to warm to CrusherX, because it reminded me of how I used to feel when Mr Morrison berated me in my physics lessons for failing to grasp Ohm's Law yet again. I'm a simple‑minded pianist at heart, not a Vulcan. To cut a long story short, I was pretty lost to begin with, and my initial sonic experiments didn't sound like much more than somebody vigorously towelling themselves down. After a while, though, I managed to evoke more ambient short‑wave‑radio types of sounds, which started to be more valuable to the ear. From there, with some playing about, it was possible to generate some lovely long, evolving textures containing a high amount of sonic interest. At the same time, CrusherX could also turn nasty and produce fingers‑down​‑the‑blackboard sounds by adjusting the depth and frequency controls in the 'cloud' section of the 'speed' panel. Both were good, but some of the results were also hugely and uncomfortably loud, especially when using the randomise function — something to bear in mind if you have neighbours of a sensitive disposition. Going through the many and varied presets, it very quickly became clear that CrusherX is an ambient musician's dream. It'll come up with everything from hour‑long soundscapes and pitchy, glitchy weirdness all the way over to downright scary noises and classic Radiophonica. I was using a soft synth to input simple tones, and pretty much every single thing that came out of CrusherX was entirely unrecognisable from the input signal. In the case of this plug‑in, that means it was doing its job very well. After a while, though, I started to tune into the fact that CrusherX added quite a metallic tone to everything it mangled. I realise that granular synthesis can have a tendency to do that anyway, but this was noticeably clangy. The pitch‑shifting is also grainy and a bit basic, but I suspect that's rather the point of it. Everything also felt like it took ages to get going, and some presets with a faster attack wouldn't go amiss when demonstrating the full range of its capabilities. Plug‑in versions €279; CrusherX‑Live! €179. Prices include VAT. Plug‑in versions €279; CrusherX‑Live! €179. 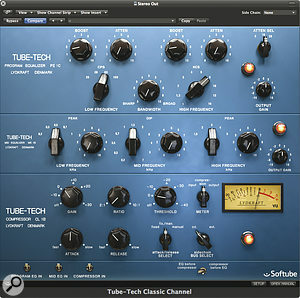 Softube's Classic Channel is not a replica of a console channel strip, but rather a combination of their existing Tube‑Tech CL1B opto compressor and their models of Tube‑Tech's take on a couple of classic Pultec equalisers. These three plug‑ins can be loaded individually, or in combination as the Classic Channel, and can process mono or stereo signals. I first tried the CL1B Opto Compressor in its TC Powercore format (reviewed June 2008: /sos/jun08/articles/pif_0608.htm) and I thought it was one of the best‑sounding compressor plug‑ins I'd tried. It just seemed to make everything sound bigger and more expensive without crushing the dynamic life out of it! See that earlier review for more details. Both Pultec‑style equalisers emulate the sound and the quirky control format of the originals, in that you can apply boost and cut at the same frequency settings. The PE1C module, which deals with the high and low end, has attenuation and boost controls available for the lower shelving band, plus a bell‑shaped high‑frequency boost and a separate shelving high‑frequency attenuation section. All offer various switched frequency selections, with a single Bandwidth control for the high boost, and an output gain control. Because the original Pultec was a passive design, there were no bandwidth or distortion issues prior to the active output gain stage, resulting in a smooth and musical sound that could be both warm and open, albeit without the forensic precision of an active parametric EQ. Those qualities are very apparent here: in fact, the only Pultec emulation I've heard that comes equally close is that made by Universal Audio for the UAD platform. As with UA, Softube's designers modelled not only the EQ curves but also the behaviour of the transformers and other circuitry to ensure the correct coloration and phase characteristics. 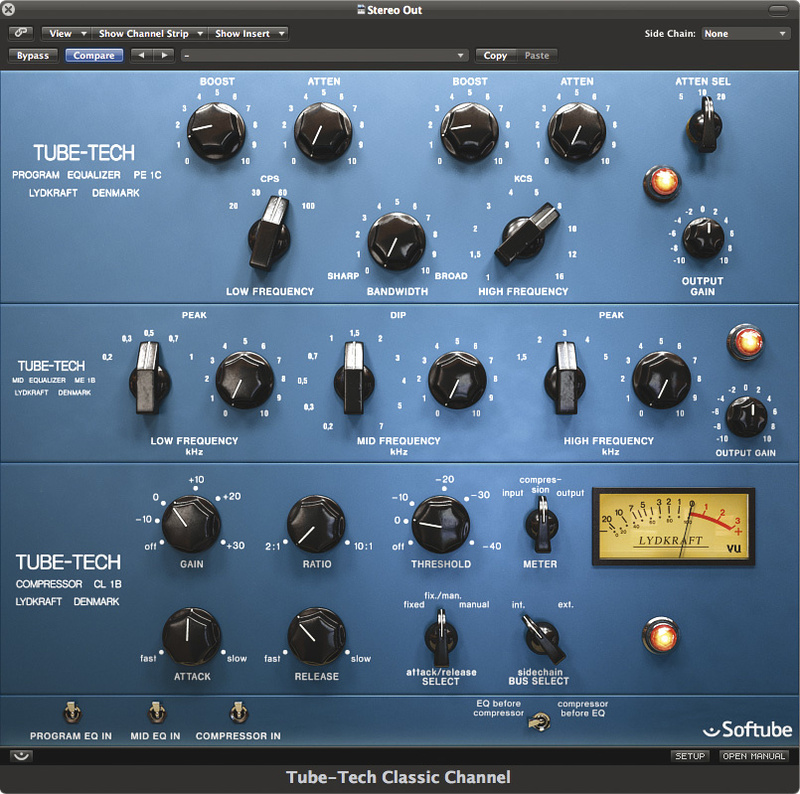 Softube's software was developed with input from the engineers at Tube‑Tech, which probably helps to explain why the models sound so close to their hardware equivalents. As you'd perhaps expect, there is a subtle difference between UA's model of the original Pultec and Softube's model of Tube‑Tech's reincarnation of that product. With UA's model of the original, setting the EQ completely flat still results in a subtle but pleasant enhancement to the sound. By contrast, this Tube‑Tech version sounds more neutral when the controls are set flat. $699; CL1B $449; PE1C $279; ME1B $199.